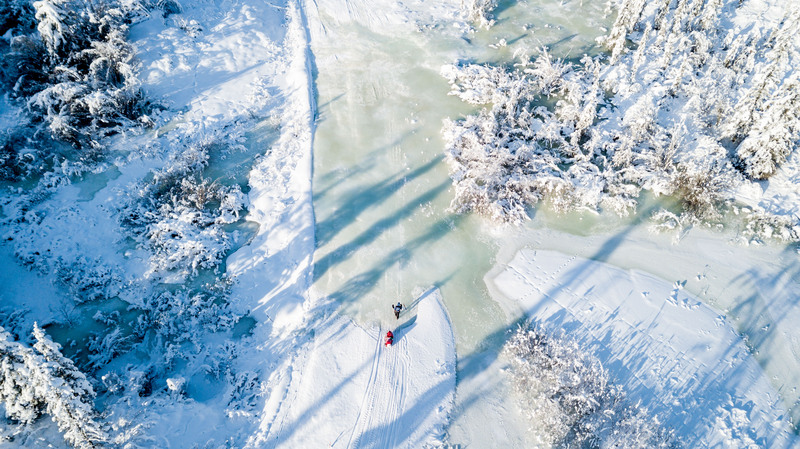 The Montane Yukon Arctic Ultra 2020 will start in Whitehorse on January 30th. It will be the 17th edition and distance available are marathon, 100 and 300 miles. The next time we offer the 430 mile race will be in 2021. The entry forms are ready and as of now it is possible to sign up. If you want to get the Application & Waiver please send an email to info@thegreatoutdoors.de. Entry fees will go up after the end of May and then again after the end of August. So, if you are certain you want to participate, it makes sense to enter before end of May. The difference between the early entry fee and the entry fee for those who sign up by end of November is quite significant. 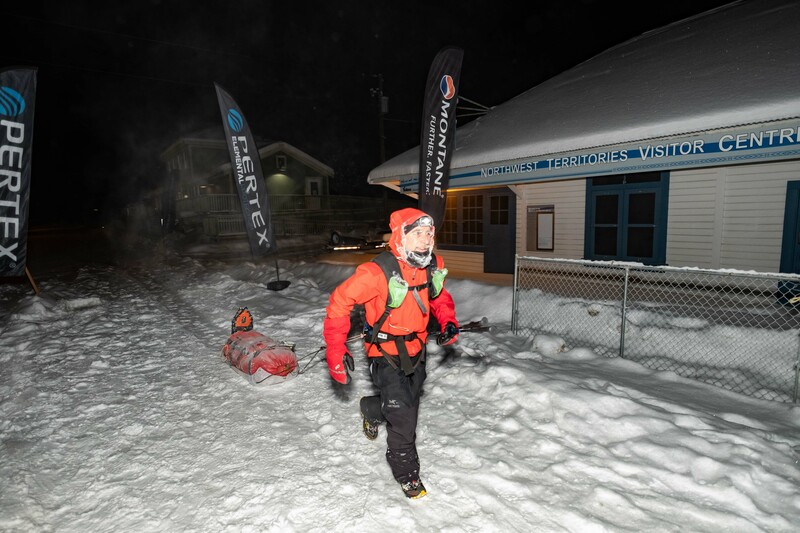 The 16th Montane Yukon Arctic Ultra is history. After the race I often get asked if I am happy about how things went. Knowing that everyone is safe, the answer is „yes, I am happy“. However, I also always think about the athletes who were not able to reach their respective finish lines. To all those who had no luck this time I want to say that it was great to have you with us. Whatever the reasons were that you could not continue, I hope you are recovering well and that the MYAU crew can welcome you again in one of the next editions! Steve Page from St. Albert, Canada, was not even able to get to the start line. His plan was to drive to Whitehorse. After 20 hours of driving a road closure due to an avalanche meant he could not arrive in time. To make things worse he then even got in a bad accident and judging by the pictures of his truck, he is lucky to have walked away from it. Hopefully, he will join us next year! The weather leading up to the MYAU was all over the place. After a cold spell it warmed up again and just in time for February 3rd it had cooled off considerably. Having extreme temperatures on day 1 almost always results in many athletes not being able to continue after day 2. But first things first. All but one of the marathon runners were able to finish. As I had already mentioned in a news update, 3 athletes actually went the wrong way towards the end due to a misunderstaning amongst the crew. They all still did finish and were credited the time they lost. Once again, my apologies for the error. Considering how cold it was, the marathoners did really well! I have seen a lot of super happy finishers at Muktuk Adventures. It was a great pleasure to have you with us! I will soon announce the donation we will give to Little footprints. Big steps – as we give 1 CAD/km run by our marathon runners to this great charity. Some ultra athletes had to stop at CP1. All others continued on to Dog Grave Lake. On the way to this checkpoint we parked an RV with medical team members Trish and Sarah. It was an „exit point“ for those getting in trouble in an area that is a bit of a cold spot. Two athletes made use of this opportunity to get to safety. Two more stayed near the RV just in case and decided to call it a day the next morning. The crew at Dog Grave Lake did a great job in this remote area of the trail. It got busy and unfortunately more athletes had to scratch at or near that checkpoint. Here we also had our worst case of frostbite. The athlete affected was Tiberiu Useriu from Romania. Tiberiu is fine but the injury was bad enough to require a helicopter transport and subsequent treatment in hospital. He has been home for some time now and I have not emailed with him again since his departure. It is my understanding that he made the simple mistake of not stopping and dealing with his feet when he should have. Since Tiberiu is a very experienced cold weather runner (he won the 6633 three times in a row), one of the lessons learnt must be that nobody can escape the cold. Not only at the MYAU it’s actually often the experienced athletes who get in trouble. So, I urge all future participants to be very careful no matter how much experience they bring to the start line. I wish Tiberiu the best possible recovery and great success with his project of creating the Via Transilvanica that he works for with so much passion! We also got reminded just how important the mental aspect is in the MYAU. Russ Reinbolt (USA) talked about it in a very interesting interview he and Pat had with the CBC. I would dare say that all MYAU participants are super well prepared physically. Often it’s the mental challenge that becomes an issue – to stay calm as much as possible and to keep reminding yourself to constantly monitor each and every little thing. Let alone all the difficulties that come up along the way and not only require physical strength but also incredible will power. Just like the marathon, the 100 mile race always seems to be over in a heartbeat. The winner, David Brabec (Canada) arrived at the finish after 23:42. Montane athlete Pablo Criado Toca (Spain) and Brady Kyle (Canada) placed 2nd and 3rd. Out of 11 who started in Whitehorse 6 were able to make it to Braeburn Lodge. Compared to the 40 athletes in the 430 mile distance, we had the relatively small number of 6 participants in the 300 mile race. All of them faced an extremely challenging trail between Braeburn and Carmacks. The main problem was lack of snow. Thus the participants had to drag their pulk sleds over roots and all kinds of other obstacles. Most athletes who still were in the race at that time made the Carmacks cut-off which is 4 days and 12 hours. But we did have more people scratching at or before Carmacks. The next part of the trail was easier. Still for some participants McCabe Creek was the end of their journey. Amongst them Shelley Gellatly (Canada) due to frostbitten fingertips and Micheal Faergegaard (Sweden) because of knee issues. 3 athletes were still in the 300 mile race at this point in time. In the lead Marianne Heading (UK), followed by Gareth Hardcastle (UK) and Ahmad Fathi Junaidi (Brunei Darussalam). And this is also the order in which they crossed the finish line. Not too long after Enrico, Pat Cooke-Rogers (UK) had to scratch on her way to Scroggie Creek. Both in 2017 and 2015 she reached Dawson with her fatbike. This time it just was not meant to be as she had problems keeping her feet warm. The remaining 12 athletes made it to Dawson. Scott Donatelli (Canada) from Carmacks onwards had to really push himself to continue on. Each time he left a checkpoint he kept telling crew that at the next checkpoint he would stop. I am glad he found the strenght to keep on believing in himself, as in the end it got him a finisher medal. For Jessie Thomson-Gladish (Canada) it was super tough, too. After having finished the Dawson race twice on foot, she had opted for xc-skis this time. A discipline I do not recommend but I guess in a way that is also then an extra challenge. And she managed to get to Dawson on her „misery sticks“ even though she had doubted it many times. Gillian Smith (Canada) was also amongst the finishers. It was her second try and even though she had shin splints and a sore wrist she made it and was welcomed by family, friends and crew! Like Gillian, Scott Thomson (Australia) was there to finish unfinished business and it was great to see him succeed. Angus Currie (UK) and Alexander Allen (UK) finished as a team. Only one other team had ever managed to do that before them. What was so great about those guys, was their incredibly good mood. No matter what the MYAU threw at them they were always smiling, laughing and enjoying it. At least when we saw them … The same goes for Javed Bhatti (UK) and Joaquin Candel (USA). Always super friendly and going at a steady pace without any major issues. With Magdalena Paschke (Germany) we had another female athlete giving it a second try. In 2017 she had to stop very early on. This year she was super strong. I don’t know how she actually managed to pull her heavy sled all this way. She is such a lightweight but there was no holding her back and at the finish line she had enough energy to make a dance of joy with the medal in her hand. This makes her and Uwe (her husband who did the 430 in 2017) the only couple where both have a 430 mile finisher medal haning on the wall. MYAU veteran Laura Trentani (Italy) was also incredibly strong, placing 3rd overall and 1st in the women’s category. 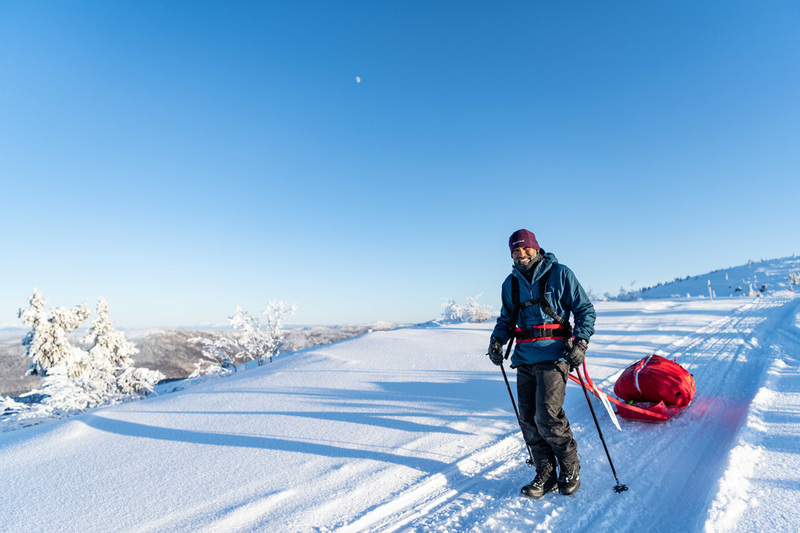 First to arrive in Dawson was Thierry Corbarieu (France) who is one of those few athletes in the world who can go fast on very little sleep and not get in trouble. In the end he was of course tired, too. But just a day after his finish he already walked around as if he had just arrived in the Yukon. Not too far behind Thierry came Christof Teuscher from the US. Like Thierry he had been able to keep a good pace and with relatively little rest. Congratulations to you all! And once again thank you to all athletes for coming! For the detailed results please check out the results table. A big thank you goes to all the crew members and volunteers who once again helped make the MYAU such a very special event. Thank you Diane, Julie, Anja, Bernhard, Fritz, Tamara, Sarah, Trish, Eleanor, Ellie, Rachel, Kate, Callum, Daniel, Gary R. and Gary V., Jeff & Jeff, Glenn, Spencer, Tony, Josh, Jean-Marc, Ross, Robert S., Mayra, Pam, Stewart and Jo. 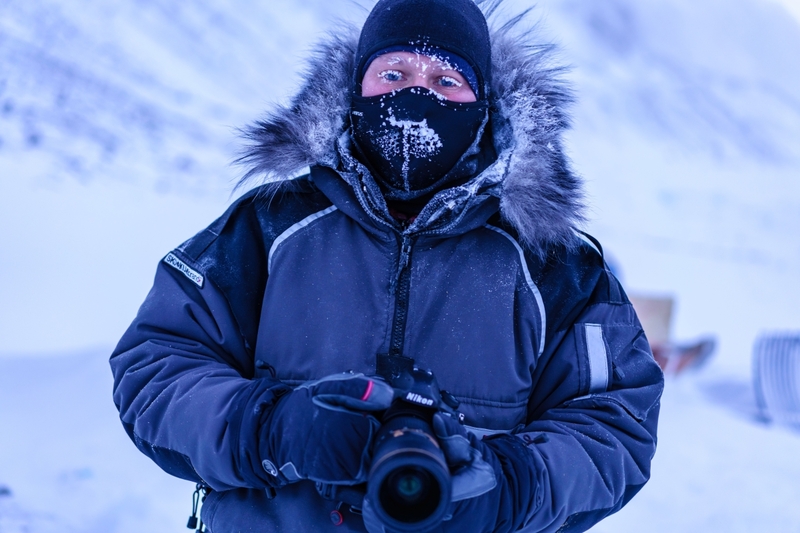 Thank you Yann and Thilo for your great films and thank you Joe and Mark for your incredible photos. Thank you also to our HQ and checkpoint hosts Don from Scuttlebutt Lodge, Muktuk Adventures, Braeburn Lodge, Bernard and his company Yukon Wilderness Fishing (Ken Lake), Carmacks Community Center, Jerry and Kathy Kruse (McCabe Creek), Selkirk First Nations (Pelly Crossing), Sue, Dale, Fabian and Woofers from Pelly Farm! Thank you Yukon Quest and Canadian Rangers! A big thank you to our title sponsor Montane for the continued support! And thank you to our new main sponsors Allied Feather & Down and Pertex. Last but not least, thank you to Primus and our local supporters Tourism Yukon, Coast High Country Inn, Downtown Hotel, Driving Force, Total North, Yukon Yamaha, Fraserway RV, Coast Mountain Sports and Atlin Mountain Coffee Roasters! I am already getting many emails about 2020. Please give me about 2 weeks. Then I should have everything ready. There are two galleries: Low Resolution and High Resolution. Low Res is suitable for small prints and web sharing and High Res is suitable for medium, large and extra large prints and photo books. Both galleries allow for purchasing of non-commercial use downloads. Prints and books can be shipped internationally. Purchases over $300 use the code MYAU30 for 30% off your order. If you have a need for commercial use of the images, please feel free to contact Mark directly at mark@depthoffield.ca. 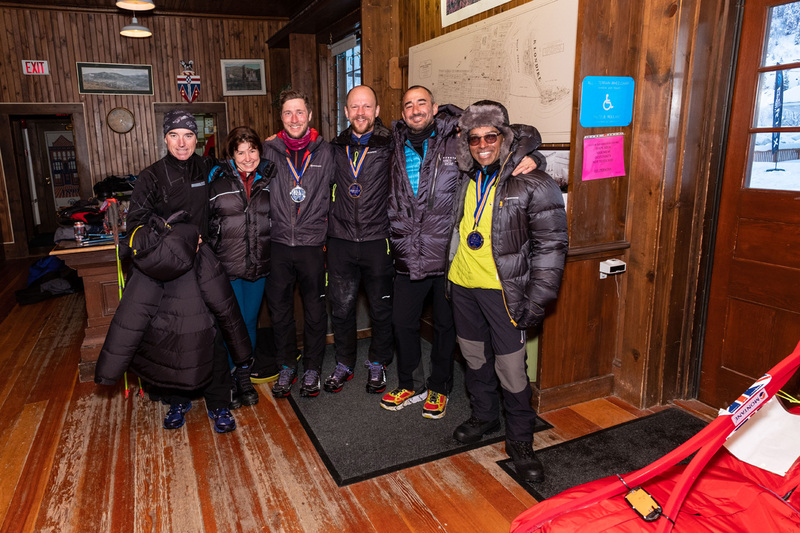 On Feb. 15th at 16:50 Angus Currie (UK) and Alexander Allen (UK) crossed the finish line as a team and as such in the team category they rank in 1st place. As individual athletes they came in 8th position. On foot they are the 2nd team that actually managed to stay together all the way and finish together. Next up was Jessie Thomson-Gladish (Canada) who won the xc-ski category and overall placed 10th. I can’t say it often enough, doing the MYAU 430 mile race is tough, no matter what. But to finish it on xc-skis is even more incredible. She told me that she was close to throwing her „misery sticks“ into the bush several times. 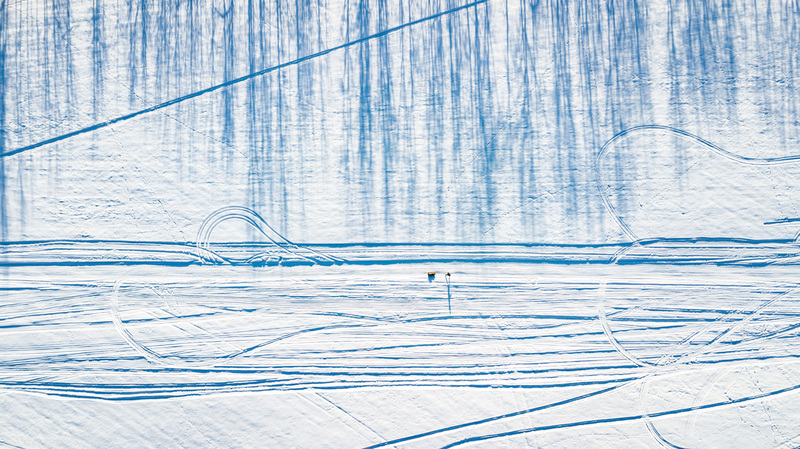 Instead she overcame those dark moments and is also the first ever woman to do the 430 miles on xc-skis. Gillian Smith (Canada) kept us in suspense with her SPOT not always sending. It was her second go at the 430 miles and she was very strong even though she had shin splints and a painful wrist. Her rank is 11th overall. Last but not least, we were able to welcome Scott Donatelli (Canada) who had left the last 4 checkpoints saying „I won’t go any further than the next one“. However, each time he found the motivation to keep on going and trying. He arrived in Dawson on the 16h at 02:41 well ahead of the cut-off. So, I am glad he did not give up. If you have not already checked it out, in our facebook group we have tons of photos and also videos. 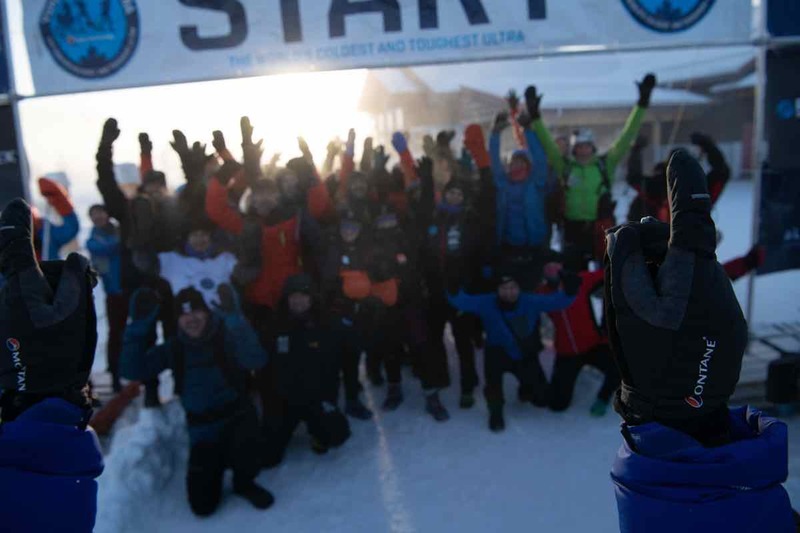 Some of the photos already are available in our gallery here on arcticultra.de. When I have faster internet, I will also upload the videos here on the website. All crew and athletes still with the race came safely back to Whitehorse last night. We had dinner and some beers at the Coast High Country Inn and it was great to see all the happy faces. Safe trip home everyone! The results table will be updated again today and then I will write my traditional, final race report. They were all tired but of course super happy to be here. All of them underwent another frostbite check and then went to refuel with pizza, burgers and coke. In the meantime Laura came for a visit to the checkpoint with some great cakes. It was her birthday yesterday and we all enjoyed the quick break from our routines. This morning we checked on all athletes still out there. Reports were that they are all doing fine. Next in line are Angus Currie and Alexander Allen (both UK) who probably broke the records for most time laughing and smiling during any MYAU. They really are enjoying themselves and they spread their contagious good mood wherever they go. After these guys we expect Jessie, Gillian and Scott. We will have to see how Scott now pushes on. For him the deadline of 13 days (i.e. tomorrow morning 10:30 AM) may be challenging but of course we all keep our fingers crossed he makes it. This great video features some of the remotest parts of trail and the final leg towards Dawson City. You will also see the Indian River wall tent checkpoint where Stewart and Anja have been taking great care of all athletes coming through. Last but not least, you can share the emotions with us of seeing our first finishers in the city of the gold rush. At 20:10 local time yesterday Laura Trentani (Italy) crossed the Dawson City finish line. She ranks third overall and first in the women’s category. Laura had already finished the Montane Yukon Arctic Ultra 100 and 300 miles in previous years. So, it has come as no surprise that she is also capable of finishing the 430 mile distance. She is super strong! In Dawson City she was greeted by crew members and fellow athletes. Now Laura is getting a well deserved rest. As always, a video full of emotions. Featuring the section from McCabe Creek, where Kathy and Jerry Kruse host us every year, all the way to Pelly Crossing and Pelly Farm. The latter is a real favourite amongst MYAU athletes as they are welcomed right into Sue’s and Dale’s home, with a treatment like no other and the legendary Pelly Farm lasagne. At 05:25 today Christof Teuscher from the USA crossed the Dawson City finish line to place 2nd in our 430 mile race. It was a hard last day for him. Due to fresh snow he had his snowshoes on pretty much all the time and he had to de-ice is pulk sled a couple of times after going through overflow. So, he was tired but also all smiles and apart from a couple of sore toe nails he had no major issues. Congratulations! Now we are waiting for Laura Trentani from Italy. Laura already finished our 300 mile distance in a previous year and is now back to also see Dawson City. She is tired but keeps pushing on. I am told she has been dreaming of having a Coke for a long time. Not much longer now. At that back, Gillian Smith (CAN), Jessie Thomson-Gladish (CAN) and a bit later also Scott Donatelli (CAN) have left Scroggie Creek. They and also all athletes in between are doing fine. The trails are soft due to yesterday’s snow and there is considerable elevation to get over. However, the finish line is now getting closer with every step and they should all make it before the 13 day cut-off.